Whether senescence prevents or promotes tumorigenesis remains controversial. Since chemotherapeutical drugs can induce cancer cells to senesce, studying senescence is essential for proposing new therapies. However, the standard and broadly used β-galactosidase assay presents major drawbacks. We propose here a rapid and sensitive flow cytometry-based assay to quantify senescence. Cahu, J., Sola, B. A Sensitive Method to Quantify Senescent Cancer Cells. J. Vis. Exp. (78), e50494, doi:10.3791/50494 (2013). Human cells do not indefinitely proliferate. Upon external and/or intrinsic cues, cells might die or enter a stable cell cycle arrest called senescence. Several cellular mechanisms, such as telomere shortening and abnormal expression of mitogenic oncogenes, have been shown to cause senescence. Senescence is not restricted to normal cells; cancer cells have also been reported to senesce. Chemotherapeutical drugs have been shown to induce senescence in cancer cells. However, it remains controversial whether senescence prevents or promotes tumorigenesis. As it might eventually be patient-specific, a rapid and sensitive method to assess senescence in cancer cell will soon be required. To this end, the standard β-galactosidase assay, the currently used method, presents major drawbacks: it is time consuming and not sensitive. We propose here a flow cytometry-based assay to study senescence on live cells. This assay offers the advantage of being rapid, sensitive, and can be coupled to the immunolabeling of various cellular markers. Since early sixties and its discovery by Hayflick and Moorhead, senescence still remains a cellular curiosity 1. Human cells do not indefinitely proliferate and, by senescence, Hayflick and Moorhead coined the cellular process of ageing. Senescence is a stable cell cycle arrest in which cells remain metabolically active as opposed to cellular death. To date, four cellular mechanisms have been shown to induce senescence: telomere shortening, DNA damage, chromatin perturbation, and abnormal expression of mitogenic oncogenes 2. This indicates that not only normal cells but also cancer cells are able to undergo senescence 3. As a matter of fact, cancer cells undergoing senescence were shown to constitute a barrier to further tumor progression 4-5. However, several reports have now pointed out that, under certain circumstances, cellular senescence can also promote malignancy 6-7. Studying senescence of cancer cells is about to become an urge in cancer research as currently used chemotherapeutic drugs can lead to senescence of cancer cells not only in vitro but also in vivo 8. The master assay to investigate for the presence of senescent cells is the β-galactosidase assay at acidic pH. This histochemical assay reflects the increased in lysosomal biogenesis occurring in most senescent cells. Briefly, exogenous X-gal, applied to cells, is cleaved by β-galactosidase enriched in lysosomes of senescent cells, giving rise to a blue color 9. 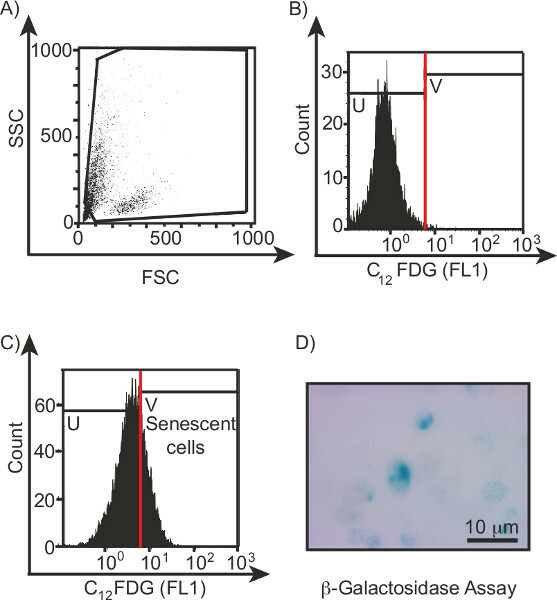 The blue senescent cells can then be quantified under a bright field microscope. Although very popular, the β-galactosidase assay presents major drawbacks. 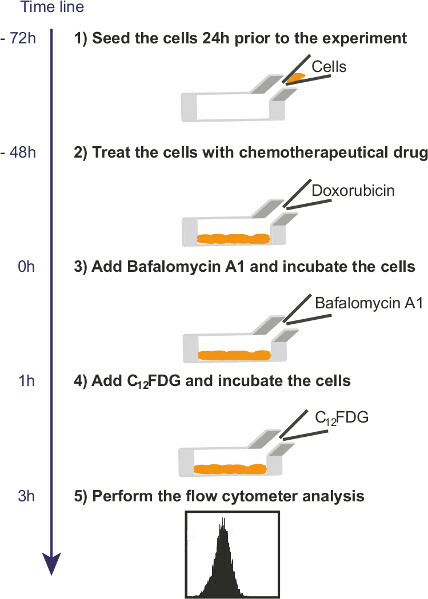 First, this assay is performed on fixed cells. Second, it is time consuming because it implies to quantify the degree of senescence by counting a significantly high number of senescent cells under a microscope. Third, this assay is not sensitive as the discrimination between senescent and non-senescent cells entirely relies on the observer. We discuss here an unexploited, quick, and sensitive cytometry-based assay to assess for the presence of live senescent cells. This assay is based on the hydrolysis of a membrane permeable molecule, the 5-dodecanoylaminofluorescein di-β-D-galactopyranoside (C12FDG), by β-galactosidase enriched in senescent cells. After hydrolysis and laser excitation, the C12FDG emits green fluorescence and can therefore be detected by flow cytometry 10, 11. The detection of senescent cells via flow cytometry offers the great advantage of being rapid and sensitive. In addition, detection of senescent cells by flow cytometry can be coupled with the detection of other cellular markers. This assay can be used to detect senescent cells within a population of cancerous cells treated with chemotherapy and can be routinely set up on tissue sections, after cellular dissociation, in clinic. Dissolve the C12FDG powder in dimethyl sulfoxide (DMSO) to a final concentration of 20 mM. Aliquot and store at -20 °C. DMSO should be used with appropriate safety conditions. Dissolve the bafilomycin A1 powder in DMSO to a final concentration of 0.1 mM. Aliquot and store at - 20 °C. Bafilomycin should be used with appropriate safety conditions. Cultivate RPMI 8226 cell line, or other cell lines adherent or not, in media containing 10% fetal bovine serum and 1% antibiotics, at 37 °C, 5% CO2. Estimate the number of cells needed for the experiment. In order to record a sufficient number of events during the flow cytometry analysis, 5 x 105 cells are required. To determine the percentage of senescent cells, three cell samples are required: unlabeled sample, untreated cells stained with C12FDG, treated cells stained with C12FDG. Seed the cells 24 hr prior performing the experiment so that cells are in the log-phase of the cellular proliferation curve. Induce senescence of cancer cells by adding a chemotherapeutical drug. Drug concentration and duration of the treatment should be adapted to the cell type tested. Start with a 48 hr treatment at the final concentration of 50 nM doxorubicin for a concentration of cells at about 106 cells/ml. Do not forget to include untreated sample (negative control). Check cell viability by mixing cells with trypan blue (v/v), as the chemotherapeutical drug used in the previous step might lead to cell apoptosis. Fill into a Malassez chamber and count the number of blue cells (dead cells) and of white cells (living cells). If the percentage of viability is less than 70%, dead cells might be removed using an appropriate kit to ensure that dead cells will not bias the subsequent analysis. Remove the culture media and replace by prewarmed fresh culture media. Treat the cells with a final concentration of 100 nM of bafilomycin A1. Bafilomycin A1 is used to neutralize the acidic pH of lysosomes. Incubate 1 hr at 37 °C, 5% CO2. Dissolve C12FDG in prewarmed fresh culture media to a final concentration of 2 mM. Add the compound to cells at a final concentration of 33 μM and incubate 2 hr at 37 °C, 5% CO2. If using non-adherent cells, centrifuge the cells at 300 x g for 5 min at 4 °C (the speed might have to be adjusted to the cell type used), wash 2x with PBS. Resuspend the cell pellet in 500 μl of cold PBS. If using adherent cells, remove the media and wash 2x with PBS. Harvest the adherent cells using a trypsin solution and centrifuge cells at 300 x g for 5 min at 4 °C (the speed might have to be adjusted to the cell type used). Resuspend the cell pellet in 500 μl of cold PBS. In both cases, the cell concentration should be about 106 cells/ml. Perform a co-immunolabeling to further characterize the population of senescent cells. Calibrate the flow cytometer using the control beads recommended by the manufacturer of the flow cytometer. For all steps, at least 104 events have to be recorded. Run the first sample containing unlabeled cells. Prepare a two-parameter graphic displaying Forward Scatter Channel (FSC) versus Side Scatter Channel (SSC). Set the PhotoMultiplier Tubes (PMTs) and define a region of interest excluding dead cells and cellular debris that might have appeared during the sample preparation. Gate this region of interest in a one-parameter histogram displaying FL1 on the log scale of the x-axis and the number of events in the y-axis. The total number of events represents the number of cells analyzed. Set the PMT so that unlabeled cells appear in the first decade on the log scale of the x-axis. Determine the autofluorescence of the cells if necessary. Run the second sample containing untreated cells. On the one-parameter histogram displaying FL1 (fluorescence of C12FDG), place the cursor after the dimly labeled population. This threshold will allow the discrimination between non-senescent cells (dimly labeled cells) and senescent cells (brightly labeled cells). 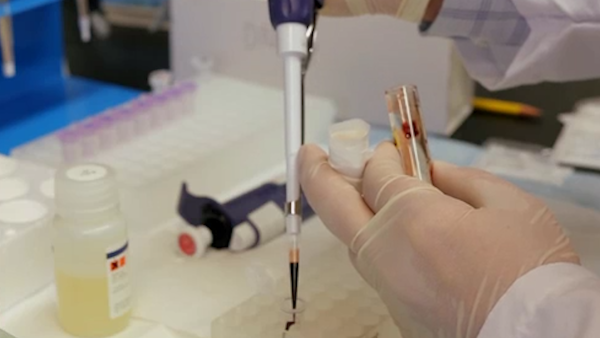 Run the third sample containing treated cells. Brightly labeled cells, i.e. senescent cells appear above the threshold determined in the previous step. Evaluate the percentage of senescent cells by dividing the number of bright events per the total number of events. If needed, the activity of the β-galactosidase can also be estimated using the mean fluorescence intensity. Multiple Myeloma, a hematological malignancy, was used to evaluate the senescence induced by a chemotherapeutical procedure. To do so a commercially available MM cell line (RPMI 8226) was treated for 2 days with doxorubicin, a chemotherapeutical drug. The cells were then subjected to bafilomycin A1 treatment and further incubated with C12FDG. Cells were analyzed by flow cytometry. Figure 1 illustrates the different steps and shows that the percentage of senescent cells can be determined within a day with the use of C12FDG. Unlabeled cells were run first in the flow cytometer. As shown in Figure 2A, a region of interest was set on the graphic FSC versus SSC to exclude dead cells and cellular debris. 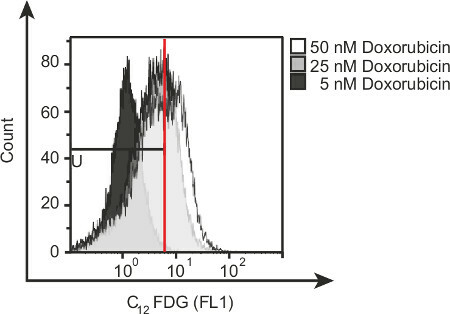 Cells in this region of interest were then gated on the histogram displaying the fluorescence of C12FDG (FL1) on the x-axis and the number of events on the y-axis. The untreated cells were analyzed. A red cursor was set after the dimly labeled population as depicted Figure 2B: non senescent cells will appear in the region U, whereas senescent cells will be present in region V. The treated cells were thereafter run in the flow cytometer. A population of brightly labeled cells appeared above the red cursor previously set, in the region V, as shown Figure 2C (left panel). This population represents senescent cells and their percentage can subsequently be calculated. In parallel, the same cell sample was stained using the β-galactosidase assay as illustrated (right panel). In this representative picture, entirely blue cells and partially blue cells are shown to illustrate the difficulty to discriminate truly blue senescent cells. To illustrate the specificity of C12FDG in the determination of the percentage of senescent cells, the cells were treated with various concentration of doxorubicin. The percentage of senescent cells was determined as in Figure 2B. The percentage of bright cells increases as a function of the doxorubicin concentration used as shown in Figure 3. This demonstrates that C12FDG labeling is specific to senescent cells. Figure 1. Overall scheme of the experiment. Cells were seeded 1 24 hr prior the treatment with the chemotherapeutical drug 2. On the day of the experiment, cells were incubated with Bafilomycin A1 3 and then with C12FDG 4. Cells were then analyzed on the flow cytometer 5. Figure 2. Flow cytometry analysis. (A) A region of interest was determined on the plot FSC versus SSC to exclude dead cells and cellular debris. (B) The untreated cells were run in the flow cytometer and the red cursor was set. (C) The treated cells were run in the flow cytometer. The senescent cells appeared above the red cursor. U and V represent the regions of interest, i.e. non senescent and senescent cells, respectively. (D) In parallel (same sample, same treatment), the cells were stained using the β-galactosidase assay. Note the various degree of the staining of the cells (entirely blue cells, partially blue cells), which illustrates the difficulty to set a threshold allowing the discrimination of senescent cells. Forward Scatter Channel (FSC), Side Scatter Channel (SSC), Fluorescence 1 (FL1). Figure 3. Specificity of the C12FDG labeling. Cells were treated with 5 (dark grey histogram), 25 (light grey histogram) and 50 nM (white histogram) of doxorubicin. U represents the region containing non-senescent cells. The percentage of senescent cells is evaluated by dividing the number of bright events per the total number of events. The percentages of senescent cells are 0.8%, 15.78%, 26.31% for a dose of 5, 25, and 50 nM doxorubicin, respectively. Table 1. Advantages and disadvantages of the C12FDG cytometry based assay and the β-galactosidase assay. (+) corresponds to higher degree while (-) and (=) correspond to minor and equivalent degrees, respectively. We presented here a flow cytometry-based method to quantify cellular senescence in live cancer cells. This method is based on the use of the membrane permeable compound, the C12FDG, and can therefore be used in any cell types and after various treatments as long as the compound is taken up by the cells. Upon cellular uptake, the C12FDG is hydrolyzed by the β-galactosidase, enriched in lysosomes of senescent cells. After laser excitation, the compound emits green fluorescence, allowing for quantification of senescent cells. This quantification of the green fluorescence can either be done by flow cytometry or by fluorescence microscopy. However, in this case, fluorescent cells will have to be counted by the observer, requiring time. Since the C12FDG is hydrolyzed by the β-galactosidase, this method allows, in addition to the quantification of senescent cells, to quantify the activity of the β-galactosidase and the localization of the enzyme, mostly present in lysosomal vesicle. Although the method is simple, attention should be drawn on step 3. The successful detection of senescent cells mostly relies on the right pH of the lysosomes. To do so, we used bafilomycin A1 to neutralize the acidic pH of lysosomes. Depending on the cell type used, this step might not be required. If senescence is expected and no staining is detected, we suggest to include a negative control for bafilomycin A1 (no bafilomycin) and to increase the concentration of bafilomycin A1. If doing so, ensure that this increase does not induce cell death. Alternatively, bafilomycin A1 can be substituted with chloroquine or any other compounds that are able to increase the pH of lysosomes. Using the described protocol, we successfully quantified the percentage of senescent cells in multiple myeloma cells following doxorubicin treatment within a day. This protocol can be used in other cancer cell types, but also in non-cancer cell types. The popular and overused β-galactosidase assay, for which the cellular pH must also be controlled, requires at least 2 days. Indeed the maximal blue color, obtained after the cleavage of X-gal by the β-galactosidase, is achieved after 12 - 16 hr of incubation 9. This assay is therefore more time consuming than the proposed cytometry based assay. Moreover, this assay is not sensitive because a bluish cell might be counted as senescent cell while being not truly senescent. The Table 1 recapitulates the advantages and disadvantages to the two techniques. The other advantage of this method is that it can be coupled with the immunostaining of cell surface makers. In the case of multiple myeloma, this has allowed us to show that multiple myeloma cancer stem cells do not senesce following doxorubicin treatment, while non-cancer stem cells do 12. Senescence has been shown to be pro-and anti-tumorigenic. Since chemotherapeutical drugs can induce senescence, studying senescence might become important in clinic. To this end, fast and sensitive assays have to be used, such as the assay we described here. We thank the SF 4206 ICORE (Université de Caen) for the use of the cytometry facility. J.C. received post-doctoral fellowships from Conseil de Radioprotection d'EDF and Conseil Régional of Basse-Normandie. Those data were part of projects funded by the Ligue Nationale contre le Cancer - Comités de l'Orne et du Calvados. Hayflick, L., Moorhead, P. S. The serial cultivation of human diploid cell strains. Experimental Cell Research. 25, 585-621 (1961). Campisi, J., d'Adda di Fagagna, F. Cellular senescence: when bad things happen to good cells. Nature Review Molecular Cell Biology. 8, (9), 729-740 (2007). Shay, J. W., Roninson, I. B. Hallmarks of senescence in carcinogenesis and cancer therapy. Oncogene. 23, (16), 2919-2933 (2004). Bartkova, J., Rezaei, N. Oncogene-induced senescence is part of the tumorigenesis barrier imposed by DNA damage checkpoints. Nature. 444, (7119), 633-637 (2006). Takacova, S., Slany, R., Bartkova, J., Stranecky, V., Dolezel, P., Luzna, P., et al. DNA damage response and inflammatory signaling limit the MLL-ENL-induced leukemogenesis in vivo. Cancer Cell. 21, 517-531 (2012). Krtolica, A., Parrinello, S., Lockett, S., Desprez, P. Y., Campisi, J. Senescent fibroblasts promote epithelial cell growth and tumorigenesis: a link between cancer and aging. Proceedings of the National Academy of Sciences. 98, 12072-12077 (2001). Coppe, J. P., Patil, C. K., Rodier, F., Sun, Y., Munoz, D. P., Goldstein, J., et al. Senescence-associated secretory phenotypes reveal cell-nonautonomous functions of oncogenic RAS and the p53 tumor suppressor. PLoS Biology. 6, 2853-2868 (2008). Roninson, I. B. Tumor cell senescence in cancer treatment. Cancer Research. 63, (11), 2705-2715 (2003). Dimri, G. P., Lee, X., et al. A biomarker that identifies senescent human cells in culture and in aging skin in vivo. Proceedings of the National Academy of Sciences. 92, (20), 9363-937 (1995). Kurz, D. J., Decary, S., Hong, Y., Erusalimsky, J. D. Senescence-associated (beta)-galactosidase reflects an increase in lysosomal mass during replicative ageing of human endothelial cells. Journal of Cell Science. 113, 3613-3622 (2000). Debacq-Chainiaux, F., Erusalimsky, J. D., Campisi, J., Toussaint, O. Protocols to detect senescence-associated beta-galactosidase (SA-betagal) activity, a biomarker of senescent cells in culture and in vivo. Nature Protocols. 4, (12), 1798-1806 (2009). Cahu, J., Bustany, S., Sola, B. Senescence-associated secretory phenotype favors the emergence of cancer stem-like cells. Cell Death and Disease. Dec 20, 3-e446 (2012). Very nice paper. I am curious about why is there one continuous histogram seen in the flow cytometry results. I expected that there would be positive (senescent cells) and a negative non-senescent population. You are seeing one histogram because you are looking at one cell population. In this cell population, you have senescent cells (C12FGD positive, i.e. population [v] on Fig 2) and non senescent cells (C12FDG negative : population [u] on Fig 2).